Save Money on Art Supplies with our Rock-Bottom Prices! 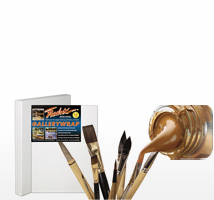 We have the widest selection of art supplies for every artist from trusted manufacturers like BEST Easels, Winsor & Newton, Liquitex, Fredrix, Kopykake and many more. Our outstanding collection of includes an array of art media for various works of art including traditional forms like painting and sculpting, as well as specialized techniques like printmaking, framing, scrapbooking, airbrushing, etching, pottery, cartooning and countless others. Your creativity is the best tool for creating art, but using the right tools will ensure a flawless product. We have these for you at unbeatable prices! Furnish your art studio with professional easels, teach a painting class with our instructional art materials, or pique the little ones� interest with kids art supplies. Whether building a full-scale painting studio or collecting art supplies and materials for your next piece, Madison Art Shop strives to offer the right art supplies for affordable and competitive prices that won�t leave you a starving artist. One of the largest art tools that you will put in your studio is your easel. It will help as you create your art and display your art. Some will even include storage for your paints & art supplies. 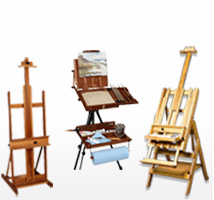 As an artist you have a wide variety of choices; easels come in many styles and sizes. 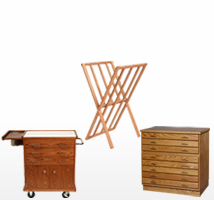 Each of the following ten types of easels has a specific purpose that suits specific needs. This guide will help you choose the right easel for you. H-Frame Easels � Just like its name, this easel�s shape is similar to the letter �H� which provides a base that is sturdier than most types. This is a rather bulky easel that does not fold easily and takes up more space than some of its slimmer, smaller cousins. However, they are classical Studio Easels. They come in various sizes and larger ones can handle canvases as large as 96 inches. Some types have paint trays attached to hold paints and art supplies. Lyre or A-Frame Easels � This is probably the type of art easel that is best known by both artists and non-artists, having that iconic easel look! It is shaped like a triangle with one rear supporting leg and two legs in front. It is easy to store since the rear leg folds into the front legs, making it flat. It is also an easel of choice for smaller spaces since it fits in a corner. There are other easels that are sturdier, but larger A-frames can also hold canvases as large as 75 inches. Display Easels � Artist don�t typically use this easel for painting because they are more delicate than work easels. They are used for display or decoration, in fact they are often referred to as decorator easels. Often you will find them with carvings or interesting designs, making them attractive for home d�cor. Single Mast Easels � This is one of the more cost effective easels. While it is not as sturdy as other easels, including the A-frame, the single mast easel is a good choice for art students, beginning artists, or anyone who needs an easel that will get the job done but at the end of the day is easy to transport and store. Giant Easels � As the name implies, giant easels are designed to large canvases � up to 120 inches tall for some models. While their larger, bulkier size allows them to support heavier, bigger canvases, their size makes them very difficult to store or transport that other easel types. 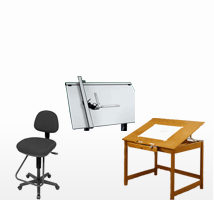 Hybrid or Convertible Easels � This is one of the most versatile types of easels. It can act as a regular, upright easel, but then unfolds to become a table top. Many different types of artists will find this easel to be quite useful. Some models have a handy paint tray for paints, brushes & art supplies, but they tend to take up more space. Art Horse or Bench Easel � This is a really cool art easel because it is also a bench. The artist can sit straddling the bench (hence calling it an �art horse�) while creating their art. This type of easel if surprisingly portable, some even have wheels, folding easily and allowing the artist to move from place to place without having to carry a chair or stool in addition to an easel. Tabletop Art Easel � The artist who works on a smaller scale will appreciate these small, extremely portable easel. Their small size means they can easily fit on a table top and are easy to store. 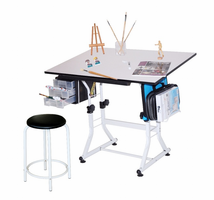 Tabletop art easels come in H-frame, A-frame, and single mast models and some have a drawer or tray for art supplies. 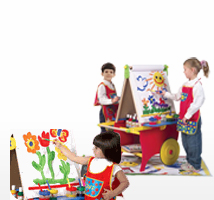 Children�s Easels � These easels are built for the littlest artists. They are usually adjustable so they can accommodate a growing little Picasso. There are different types, some are two sided, some have dry erase boards or chalk boards, and they may have drawers or trays for art supplies. A child�s easel is a great addition to the playroom � and a great way to introduce your child to the wonderful world of art. It can be tough to find just the right art supplies gift for the artist in your life, especially if you aren't the artsy type. You can pick up some great gifts and score serious points with our art supplies gift ideas for artists. Art sets are great artist gift ideas. With many different types, you are sure to find one that is just right for the artist in your life. 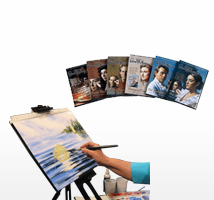 There are sets for acrylic, oil, pastel, watercolor and many other art materials. 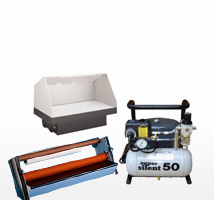 Sets usually include the media such as paints, pastels, charcoal, or other materials, as well as brushes, trays, and palettes. Some also include canvases or paper. Art supplies sets tend to be packaged for portability as well as to make attractive gifts. Every artist can find a use for an art easel. This makes them a great gift for an artist. You have plenty of choices when it comes to easels so you can get just the right one. 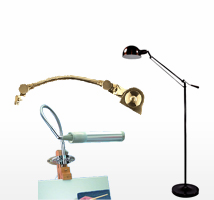 Maybe you will pick up an A-frame easel or a plein-aire easel, or perhaps a French easel is more what you need. Think about how the artist will use the easel, whether they will keep it in their studio or take it outside � all of these factors come into play as you decide. Then you can be certain to choose the best one. 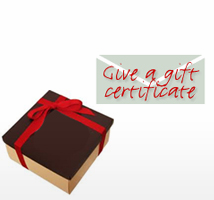 A gift certificate from an art supply store is a wonderful gift idea. When you get an Art Supplies gift certificate you can be sure that the artist in your life will be able to get exactly what they want or need. Choosing an amount doesn�t have to be frustrating either; simply get whatever amount you can. Any Gift Certificate will be appreciated! The gift of education is an invaluable one. Giving an instructional art DVD, book or kit helps the artist expand their craft and become better at what they do. Many kids have a DVD or video accompanied by a book so the artist can follow along. This gift is perfect for beginners, intermediate dabblers, as well as seasoned artists. Art supplies are a great gift for an artist. You can pick up essential art supplies like canvases or a sable brush set. Palettes are also a great hit. Think about what your artist prefers and pick up art tools for that media. If they are interested in exploring other media, you can help open that door by getting them art supplies sets or materials that they can use to get started. Selecting a gift for the artist in your life doesn�t have to be difficult. Even if you aren't familiar with art, you can find here plenty of art supplies gift ideas online. An online art store is the perfect place to do a little research and you can often find great discounted art supplies as well. The artist in your life will love the time, effort, and though you put into their wonderful gift of art. When you first embark on the exciting journey of outfitting your art studio, it is easy to get caught up in the romance of it all. You want to put your own personal stamp on it; make it your own with furnishings and d�cor that suit your own personal style. Eventually, though, you will get to the good stuff � art supplies & materials. You can get art supplies from a lot of different places, but not all are created equal. Sure, you can find them at your local mass merchandise store, but typically they will be a lower grade than what you would find at an art supply store. 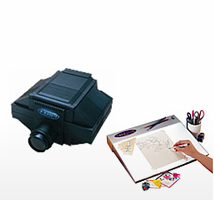 Student grade art supplies are somewhat higher quality and often find their way into the studios of new artists. Serious artists prefer to work with high quality art supplies products and that is what they use in their studios. High quality art supplies are often a little pricier than their lower quality counterparts, but the results are well worth the cost. Paints that are of a better quality will often have the highest pigment load. They undergo better processing methods and use better quality pigments with no or few fillers. They usually have better tinting strength. Entire books have been written on choosing the right brush. It is a tool that actually acts as an extension of the artist as they apply the paint to the canvas. There are different types of brushes of different qualities. Camel hair is a popular type but as you choose your brushes, make sure you are choosing the right shapes and hair types for the tasks you want them to perform. You have to take into account the properties of the paint, the technique you are using, and the properties of the surface on which you will be painting. If you are getting good paint and good brushes, then good canvases are definitely in order. To be clear, canvas is a term that describes any material that is used for painting. There are many different kinds, both natural fibers and synthetic � although synthetic is not all that common. Cotton duck is the most popular and linen is a close second. The weight, or material thickness, as well as the weave, are what sets high quality canvases apart from low quality ones. When choosing Cotton duck canvas, the weight and weave is very important. While it is usually the least expensive option, the price does increase as the weave gets tighter. Gallery Wrap canvases have thicker/wider frames and are stapled in the back (not the side.) Besides being a higher quality, artists often just paint the deeper sides in lieu of traditional framing, for a no-cost modern look. A good easel is another must for your art studio. An A-frame or H-frame easel and a stool are great furnishing for a brand new studio. Then again, these types of easels are timeless and work great for any artist. An art horse, or bench easel, is another great additions, especially if you like to work outside. It is very portable and eliminates the need for lugging around both an easel and a chair � the easel and bench are conveniently one piece. 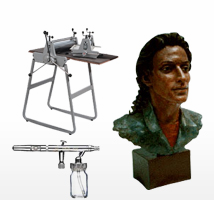 Depending on your studio�s size, you may elect to use several art easels for use and for display. A-frames and tabletop easels are good choices if you are designating a corner of your living space as a studio. These easels are smaller, easier to store and the A-frame fits nicely in a corner. For a larger space � and bigger canvases � a sturdier easel may be in order. Moving your art to a studio means taking it to another level. You are consciously designating a space to the creation of your art, whatever that may be. When starting out, the expenses may be overwhelming, especially if you are trying to purchase top quality products right away. While top quality art supplies are certainly optimal, you shouldn't beat yourself up if you can�t afford them right away. Start out getting the highest quality art supplies that you can afford.